The recent murders outside of a Planned Parenthood clinic in Colorado Springs, CO, at the hands of Robert Lewis Dear, produced a spate of familiar narratives in the media, such as the state of his mental health, his anti-abortion stance, and his status as a recluse who “preferred to be left alone.” A less common narrative, though one that is occurring with more frequency in recent years, is the call for labeling Dear a “terrorist,” in connection with the profiles of other white male perpetrators of mass violence directed against government institutions or minority communities within the U.S. Some have taken this a step further, suggesting that Dear be labeled a “Christian terrorist,” with much hand wringing in the mainstream over what to do with his Christian identity. For scholars of religion, the point is not to rigidly define what Islam is, as if that were a static entity immune from particular historical, political, and cultural circumstances, but rather to analyze what it is made to be and do by people acting in different contexts. 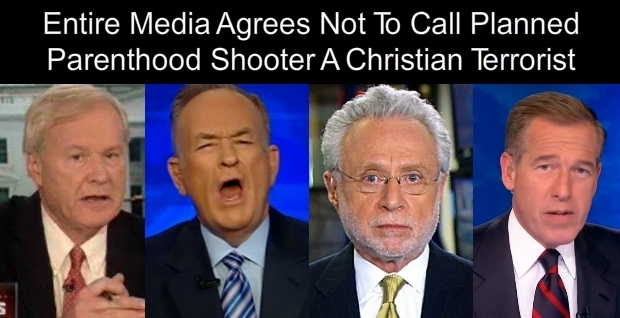 In this particular case, the term “Christian terrorism” appears to be aimed at calling attention to the double standard of how religious identity is always front-and-center when such acts are committed by those who identify as Muslim—hence the call by some for all Christians to come out and condemn this act. However much the label “Christian terrorism” may be intended to point out this hypocrisy and thus to de-center the privilege of a Christian-centric discourse within the U.S., the two terms are not equivalent as they are subject to very different classificatory schemas and constellations of power. More importantly, the call to label certain acts of violence as “Christian terrorism” reinforces the legitimacy of using its “Islamic” counter-part, while having very different effects on the communities it implicates in the process. Building on Rollens’ call to shift attention from what a particular religious group is to what it “is made to be and do,” I propose 6 theses on “Christian” vs. “Muslim” terrorism in the contemporary U.S., in order to tease out some of the ways that these terms function differently in this current historical moment. Note: Here I define violence as acts of physical aggression against civilians, and private or government institutions that usually, but not always, result in deaths (e.g., the burning of a mosque or a black church may or may not result in death, but has a similar traumatizing effect on the communities involved). Thesis two: The use of the term “Christian terrorism” in the contemporary U.S. plays into a symbolic economy that is primarily coded as a “domestic” or “internal” affair that is typically framed as the product of extreme factions within mainstream culture, commonly reflected through divisions between the Democratic and Republican parties. In this sense, it is caught up in a (comparatively) less complex set of relations and motivations that are more familiar to Americans and are perceived to be local in scale. Unlike acts of “Islamic terrorism,” here the stakes are related to domestic political contests, such as the legality of abortion, and, while such acts are roundly condemned in the mainstream media, they are nonetheless fueled by politicians and civil society groups (as with attempts to defund Planned Parenthood), who may even quietly endorse such actions. In this way, “Christian terrorism” often reflects the anger of a significant “in-group” in the U.S., and therefore expresses symbolic values that are widely supported within certain constituencies. Thesis three: “Islamic terrorism” is a racialized signifier in the U.S. that tends to implicate all those who share certain identifiable features deemed “Muslim.” Those signified as Muslim therefore carry a “representational burden,” to borrow a phrase from Franz Fanon, in at least two distinct ways: first they are marked by characteristics that are perceived by some to be at odds with a normative American identity, including markers of ethnicity (e.g., names, accents, language, dress, and skin color), along with stereotyped perceptions about their religious beliefs and practices. Second, they carry a burden of association and (sometimes) culpability when others commit acts of violence (both in the U.S., and against Western targets abroad) who share similar markers of identity. This often results in blowback against people or places (such as mosques) and thus adds fuel to the cycle of violence. Thesis four: “Christian terrorism” is not a racialized signifier, as it tends to signify white males, though it does not, typically, implicate all whites or all Christians when labeled as such. 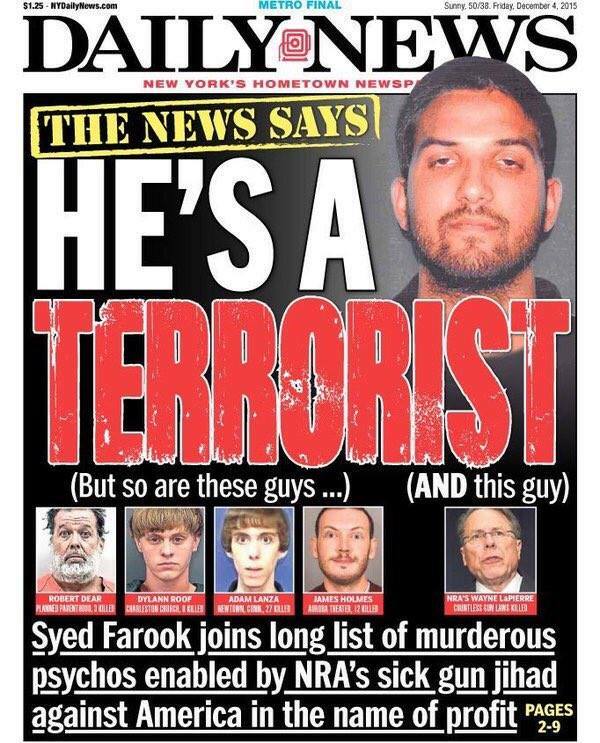 While this rhetoric appears to be shifting, as evidenced in the picture from the Daily News below, its valence is perceived as significantly less threatening than “Islamic terrorism,” due in part to the fact that “white” remains a normative identity in the U.S., and Christianity is widely recognized as the dominant religion. Thesis five: “Islamic terrorism” within the U.S. is always linked to the religious beliefs of the perpetrators, which is based on a narrow understanding of the Qur’an, Islamic theologies, and of the many factions or sects within Islam. In this sense, it is more easily caricatured and maligned, and typically forces those who are identified as Muslim to respond by interpolating their identities in relation to normative American values rather than describe their position in terms of Islamic beliefs and practices. The use of this term therefore places those identified as Muslim in a double bind—forced to simultaneously assert their allegiance to American values and to proclaim Islam a “religion of peace,” without much discursive space to defend this proposition (i.e., theologically) in anything but simplistic and rhetorical terms. Thesis six: “Christian terrorism” within the U.S. is sometimes linked to the religious beliefs of the perpetrators, though only when its targets are explicitly tied to issues such as abortion and thus bares an identifiable “religious” valence. In this sense, it does not impose the same burden of association on “all Christians,” since, for example, more liberal, mainline Protestant and Catholic communities are widely understood not to endorse such acts, even if they condemn abortion privately or as part of their doctrinal platforms. Moreover, the visibility, power, and cultural embeddedness of such communities enables a much broader discursive space to reject this proposition (e.g., “we are not those kind of Christians”) and for such positions to be understood on terms that are more familiar to the American public at large. It should be clear that these theses are highly generalized and tentative propositions, that are intended to provoke and push back against the use of the term “Christian terrorism” as somehow equivalent to its “Islamic” counterpart. As I’ve attempted to argue here, the use of this term does not level the playing field for those identified as “Christian” or “Muslim,” but rather reinforces existing power dynamics within the contemporary U.S., by continuing to implicate those identified as Muslim in ways that are not the same for those identified as Christian. As should also be clear by my nod to Sarah Rollens’ observations at the beginning of this post, more precise, contextual, and localized concepts are necessary in order to grapple with the complexity of these issues, which are occurring with alarming frequency of late and thus require more careful and considered attention. This entry was posted in Matt Sheedy, Politics and Religion, Religion and Society, Religion and Theory, Religion in the News, Theory and Method, Uncategorized and tagged Bernard Lewis, Christian terrorism, Franz Fanon, Planned Parenthood, representational bürden, Robert Lewis Dear, Sarah Rollens. Bookmark the permalink. While I find little to object to on theses 1-4, it seems to me that 5 (and, by implication, 6) perhaps miss the underlying rationale for linking religion and violence the way they have been. On what I take to be the most obvious level, “Islamic” is used to describe terrorism because that’s how the terrorist him/herself describes the act. There is little doubt that “Islamic terrorists” see themselves acting as “the Right hand of Allah,” if you will. Based on their declaration prior and during such acts, they see their actions as serving divine purposes. But more importantly, while they may occupy a minority (though perhaps not “narrow”) position within Islam, writ large, there is ample evidence that theirs is a reasonably coherent appeal to a particular, not-tenuous strand within Islamic theology. Assuming that I’ve just outlined a sort of “playbook” by which we apply the descriptor ” terrorists”–i.e. sees him/herself as engaged in a religious act and can appeal to one or more strands within the tradition’s history–it is more difficult to meet the same criteria for the so-called “Christian terrorist.” Such an individual or group must work harder to find orthodox (or even heterodox) sources to which they can appeal for divine justification. In fact, my sense is that Christian terrorists” rely on “divine revelation” to a much larger degree than Muslim terrorists because such strands within the tradition are much more difficult find/tease out. If I can go so far as to lay a few of my cards on the table, I would more inclined to use the descriptor of “Christian” if it were tied to a serial killer who described himself an as Inquisitor and ran around torturing people to confess (Anders Breivik creeps comes to mind here), insofar as such acts were considered as orthodox, even if only for a time. Disclaimer: I’m not offering a thesis here that these descriptors *are* used correctly, simply that it’s *possible* that they are and that we, as religion scholars, seem to be uncomfortable with that line of inquiry for some reason. Thanks for your thoughts Carl! Allow me to respond point by point. I agree with your last point and have no qualms with labelling such theologies as Islamic (my criterion here is pretty minimal: if it calls itself “Islamic” then it exists within the broader ideological constellation of “Islam” writ large. Whether or not this aligns with particular theologies/orthodoxies is a separate question, and is the domain of theologians to address (i.e., whether or not they see it as a legit expression of their own doctrines). And while I agree that we should take seriously claims that such actions serve divine purposes, I hesitate to generalize intentions here based solely on purported “religious language.” The use of such language may be taken up for multiple reasons (e.g., expediency, b/c it aligns with a certain rhetoric that is effective in evoking certain sentiments, etc.) and always serves material ends in the here and now. Whether or not perpetrators “believe” they are serving “divine ends” (and this is hard to ultimately determine, no? ), they are certainly working to establish material ends, whether their language admits of this or not. I’m curious if you could elaborate on why “Christians” must work harder to find sources of appeal in such cases? It seems to me that there are many such examples, and, in the case of this post, they take on a particular, contemporary valence that is more couched in rhetoric typical of certain facets of American culture than of scripture per se (e.g., talking of “baby parts” rather than quoting scripture). More important, however, is that I am rejecting the use of these terms altogether. While space does not allow me to elaborate on this (perhaps the topic of another post! ), if I can simplify–the modifiers “Christian” and “Islamic” do certain things when applied to the concept “terrorism.” These things are uneven and can have the effect of implicating all those who are identified as such, esp. Muslims living within the West. In, short, I think these terms are far too rhetorically loaded to be of much analytic use and tend to mask a more nuanced analysis of what is at stake for particular social actors. Incidentally, I have no problem with attempts to pinpoint certain theological strains and think that we should always strive to do so rather than use the broad brush religion writ large signifiers. I don’t disagree, though with one important caveat: to call something a “religious motivation” is hardly self-evident in terms of what it signifies, and, the extent to which theological ideas are implicated, the task should be to show how they function in particular contexts rather than generalize about how they are primary causal forces. In other words, motivation does not come from “religious ideas” per se, but the (re)production and use of said ideas. I have no doubt that Christian theologies influence anti-abortion acts of violence. But those theologies mean nothing on their own, and exist in an economy of relations (political, socio-economic, gendered, racial, etc.) that make them meaningful and call them to our attention. That these theologies function differently in Canada or, say, Denmark, should suggests that their (re)production is context-dependent and not prima facie scripturally determined. I don’t disagree with the assertion that one religion *can* be more violent than another, but only if we de-historicize and generalize its uses and effects. The history of Islam is markedly more violent than Jainism, but who gets to determine what constitutes normative Islam? This is a shifting boundary that is made to do all sorts of things, none of which are inherent, in the DNA, so to speak. It seems to me that one of the biggest challenges for scholars is to parse out reasons why violence committed by those who identify as Muslim (or are identified as such, regardless of their own self-descriptions) tends to be coded as “Islamic” (or the equally problematic defence that it’s not “true Islam”), while violence committed by people who identify as Christian often is not. My point is that the use of the religious modifier tends to beg the question in advance (i.e., of “religious” motivation), rather than search for the ways in which a religious identity is part of a larger constellation of reasons or motivations. Nicely done Matt, nicely done. I think I missed this when if first came out in December… you should turn this into an article.